Pundit Ganga Dhara Panda joined HCCNA in June, 2017 as a priest. Pundit Ganga Dhara Panda was born on March 25, 1984 in Odisha India. Pundit Ganga Dhara Panda studied in the Daiveeya Vishwaprakashan Peetha Yjnanusthana Vibhag of Swami Brahmananda Saraswati Charitable Trust, Allahabad for 3 years during 2000-2003 after his XII grade. Since then he has served as temple priest in Sree Neelachala Seva Sangha, Delhi during 2004-08 and at Jagannatha Mandir, Delhi during 2008-11. 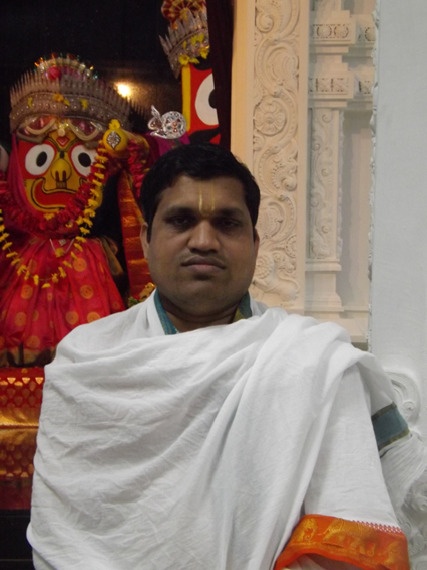 Since 2011 he has been serving as a chief Temple priest at Lord Jagannatha College of Engg at Kanyakumari. He is well versed in Odissi, Sanskrit and Hindi.